Being smart with money is learned, so teach your young adults what they need to know to be financially successful. Teenagers may be inundated with school work, college preparation, sports, work, and other extracurricular activities, but that just means there are plenty of opportunities to teach them about finances in real-time. Helping your teenager grasp important financial concepts doesn’t have to be an academic endeavor. In fact, you are likely teaching lasting financial lessons as we speak without even realizing it. You probably figured out a long time ago that your children are like sponges and soak up everything they experience. Children are keenly observant and yours started mimicking your behaviors from an early, more adorable age. As a teenager, their money mindset is shaped by the money habits you model for them. So how can you take everyday life to educate your adolescent about money? Here are ten ways you can help your teen handle their finances responsibly and make smart money choices that can last a lifetime. Summer and after school jobs are wonderful for teenagers, helping to make the money lessons you taught them growing up intimately relevant. It’s one thing for your teen to make financial choices with your money, but you will notice they may not part with their own money quite so quickly once they fully grasp how much one has to work to earn that precious dollar. It may even influence their education and career choices once they experience earning money for themselves. Once they are earning their own money, consider having them contribute or cover certain expenses like their cell phone and car insurance. The lesson here is that everyday necessities like having a phone and driving a car come with a price tag. They will learn that their full paycheck can’t go toward discretionary spending. Your teen may not be paying the cable and internet bill, but no need to shield them from the cost of fixed expenses either. Just having an idea of how much it costs to run a household will prevent them from being totally shocked when they are out on their own one day. Having knowledge about household finances can help make them feel more comfortable with them later. If your teen isn’t self-motivated to save, make them. Saving money is one of the most important money lessons you can foster in your young adult. Together, determine a percentage of their income (or allowance) they should save. We recommend twenty percent so they have that number engrained in their head for when they really start saving for retirement! Beyond their financial obligations, allow your teenager to spend their money as they choose. It’s valuable for your child to make personal financial choices with their money. It’s this freedom to decide for themselves that will nurture that sense of financial responsibility. As a parent, it can be hard to watch your children misstep. In the case of personal finances though, we think it’s better if they make some mistakes they can learn from now when the consequences aren’t as big or long-lasting. Failure can be an excellent teacher. With Mom and Dad right there to help them learn a valuable lesson, hopefully they won’t make the same financial mistake again. You may literally cringe when you see your son or daughter over spend with a credit card or take on a car loan that really stretches him to capacity. You can try your best to impart all your financial wisdom onto your kids, but at some point they may need to figure certain lessons out the hard way. Along with giving your teen the freedom to make choices with their money, even some mistakes, resist the urge to swoop in and save them before they have a chance to save themselves. Don’t co-sign a loan or pay off their credit card balance for them. Do help them establish and maintain good credit by setting a good example. Do help them make a plan for paying off debt if they let their spending creep beyond their means one month. A good way to think of it at this stage is to coach your teen through financial decisions. Once your child is earning some income, why not help them open a Roth IRA? What an opportunity to teach your child about planning for the future and the power of compounding interest! When choosing a higher education institution, make the overall cost relative to the potential return on investment part of the conversation you have with your teen. Be transparent about how much money you will contribute toward their education, and then help them understand their financial obligation for the schools they are considering. It’s worthwhile to research the job market and income potential for the career path(s) your young adult is considering, and then factor in the cost of education to make a financially-minded decision. They may roll their eyes at you now, but they may thank you for the financial guidance later. Financial opportunities exist, and equipping your teen with the know-how to find them is a lifelong skill that can serve them well. Free money exists; you just have to be willing to look for it. As you are discussing the financial aspect of their higher education, give them the tools they need to find other means to fund their education other than you and student loans. Walk them through the process of applying for student loans, and review their options so that they can make the best financial decision for their situation. 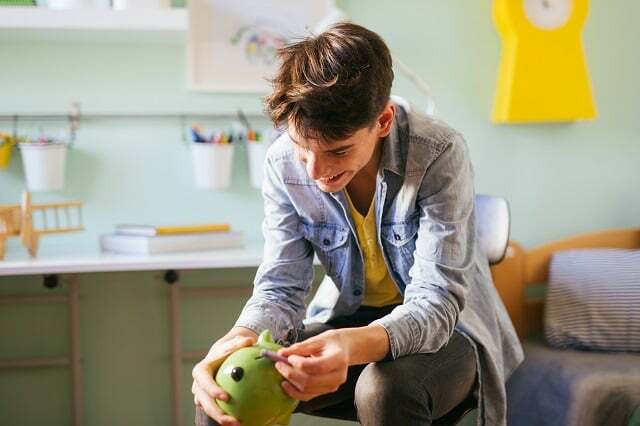 Whether you try all or some of these methods for teaching financial responsibility to your teenager, most children learn about money from their parents. They will learn and observe what to do… and also what not to do. Don’t overthink it. Just let your everyday life together and the issues that affect them most in their season of self-discovery be your classroom for practical financial education. What financial concepts do you want your teenager to fully grasp? Let us know so we can help by providing even more resources to you.